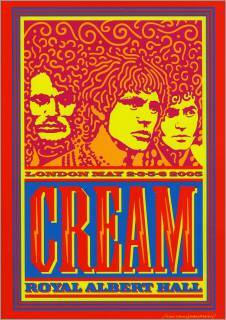 Eagle Rock Entertainment are proud to announce the release on 10 October 2011 of the “Royal Albert Hall – London 05” Blu-ray from Cream [Cat No ERBRD5096]. This show was, of course, a reunion of the original Cream line-up of Ginger Baker (drums), Jack Bruce (bass & vocals) and Eric Clapton (guitar and vocals). “Royal Albert Hall – London 05” features many of their classic songs including: “Spoonful”, “Badge”, “Crossroads”, “White Room”, “Sunshine Of Your Love” and more. Cream’s short original existence from 1966 to 1968 belies their status as one of the most influential rock bands of all time. They released four studio albums that were hugely successful around the world and had a number of hit singles on both sides of the Atlantic. In May 2005 Cream reunited for a sequence of concerts over four nights at London’s Royal Albert Hall. Filmed in high definition, this Blu-ray features tracks filmed across the four shows including many of their best loved songs. Bonus Features on “Royal Albert Hall – London 05” include interviews with Ginger Baker, Jack Bruce and Eric Clapton, as well as alternate takes of three tracks: “Sleepy Time Time”, “We’re Going Wrong” and “Sunshine Of Your Love”. Despite a gap of nearly 40 years, as “Royal Albert Hall – London 05” amply demonstrates, the band quickly reignited the chemistry that had contributed so much to their legendary status and delivered four magnificent concerts that delighted the lucky fans who had snapped up the tickets. Unable to attend the gigs in 2005…. That is my never ending lament….. Will buy this, of course….. but not even blu-ray technology will help me get over my sadness….